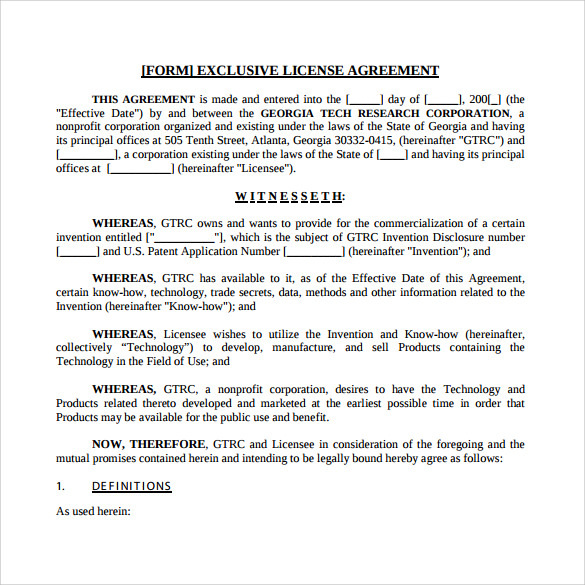 Whether you want to use someone’s intellectual property like software, inventions, patents etc. 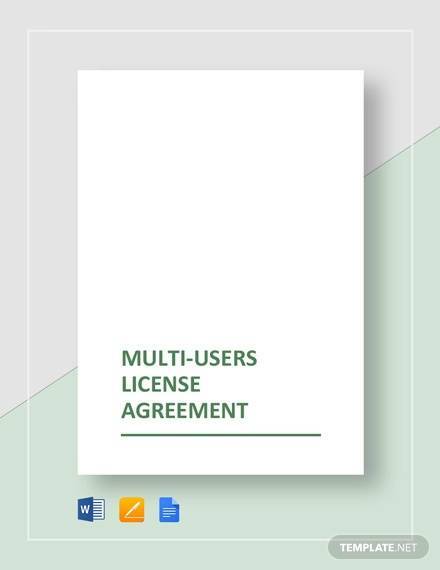 or let people use yours with or without any exchange of royalty, a License Agreements is a must to protect your rights on your works and ideas and ensure that someone else do not claim it to be theirs in the long run. 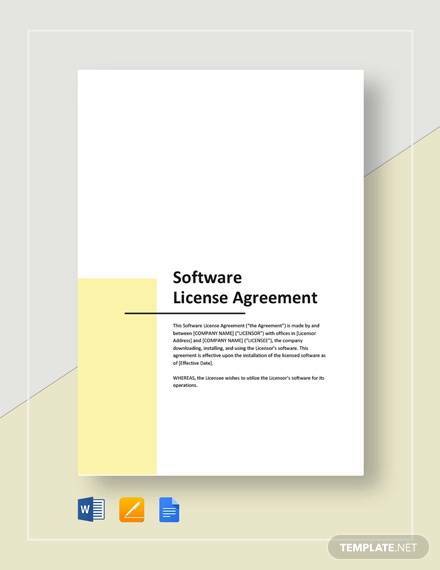 We have a huge collection of professionally designed license agreement templates that can be used for any category of license agreement including trademarks, service marks, Software License Agreement etc. 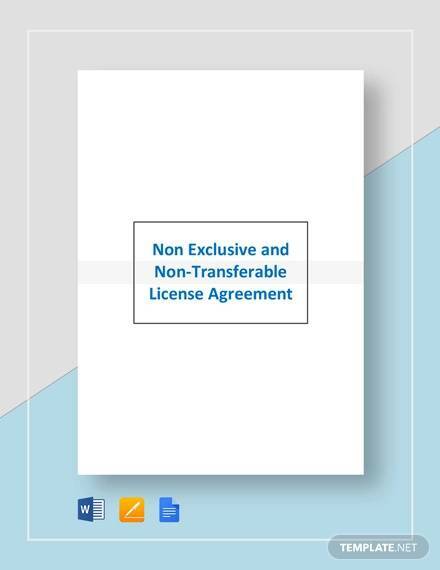 These are available in both word and PDF formats. 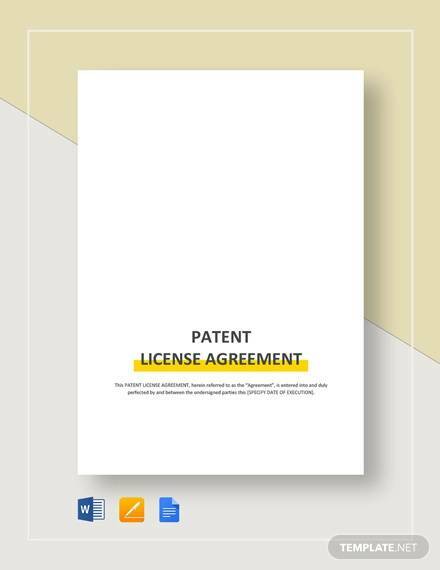 Download our free samples and examples to get relevant ideas on this kind of legal document. 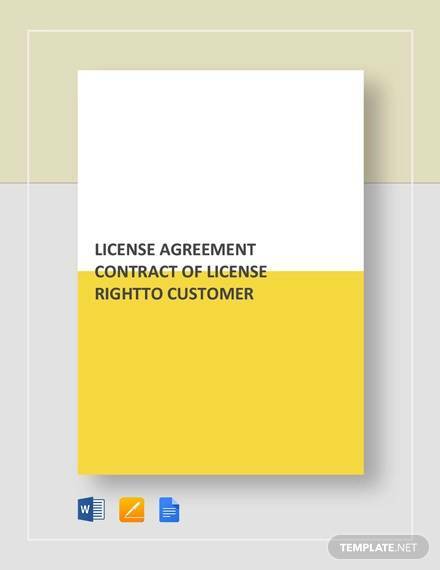 If you need to sign an exclusive agreement with your client then it’s a must for you to maintain a proper format and professional language. Thus this template can help you enormously as this template is done in accordance with all the guidelines and formats for your help. 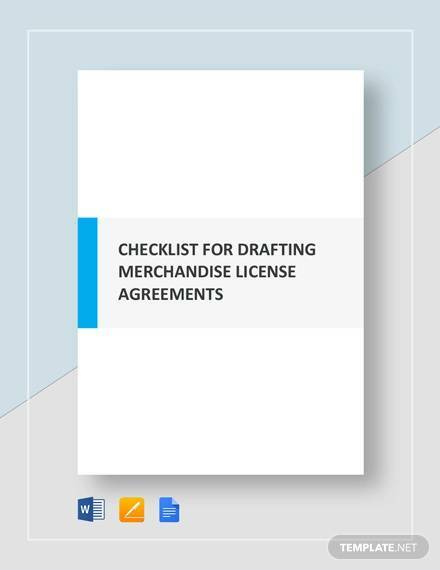 For using a product you may need to sign the product license, but if you don’t know the clause and regulations that can safeguard your interest then it can pose a problem for you. 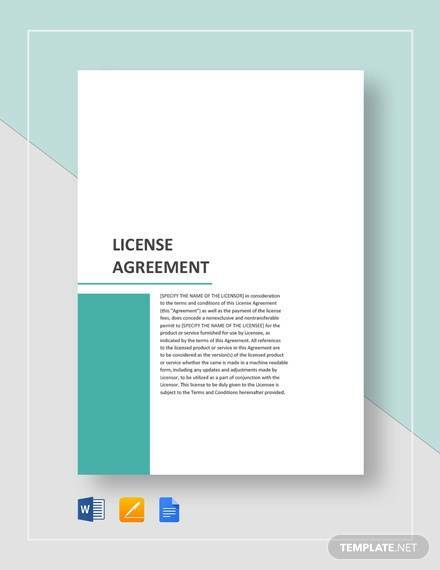 With this free template, you can create top quality license agreement easily. 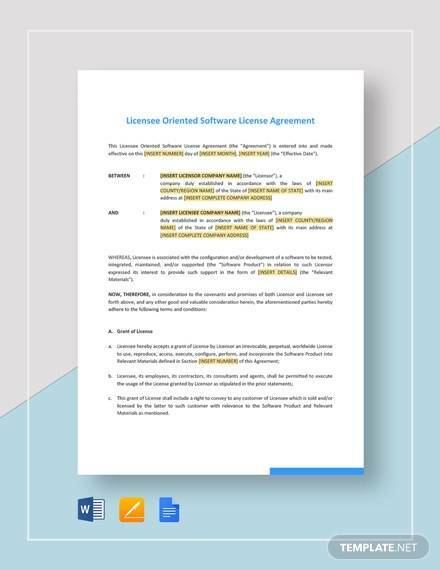 In software license agreement is totally different from any other kind of agreements due to its complexities and clauses. 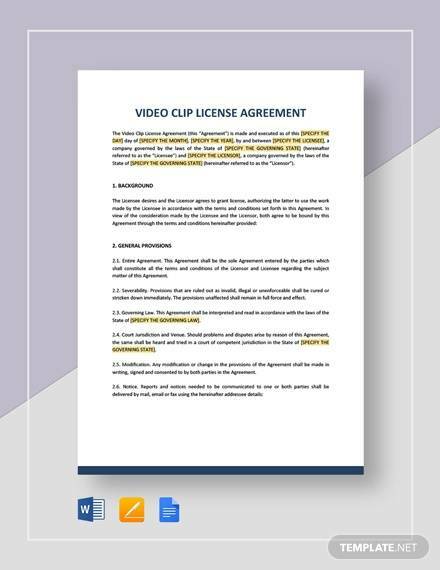 If you are not conversant with this kind of agreement then with the help of this template you can create one without any hindrances. 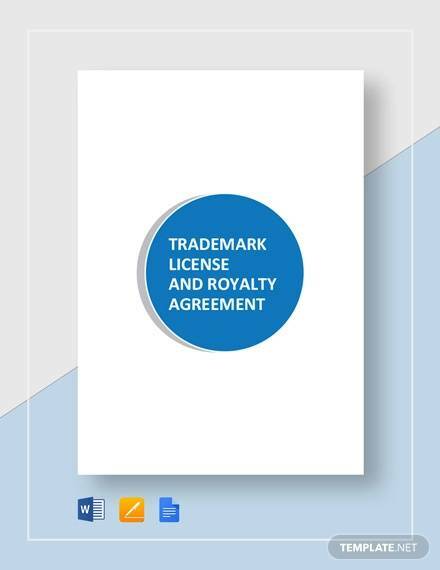 This free downloadable template is a good example of the trademark agreement. 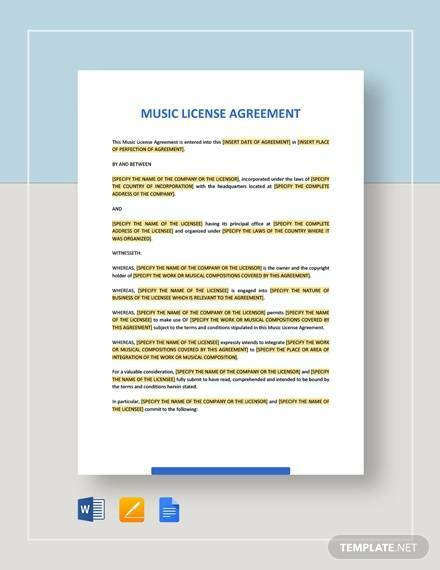 So if you are searching for a good quality professionally written agreement then download it and use it for your purpose. 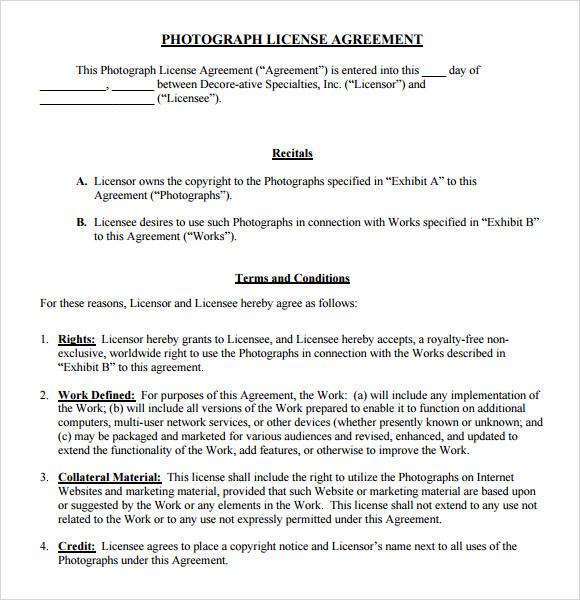 Just fill the blank fields and print it to get top quality agreement copy. 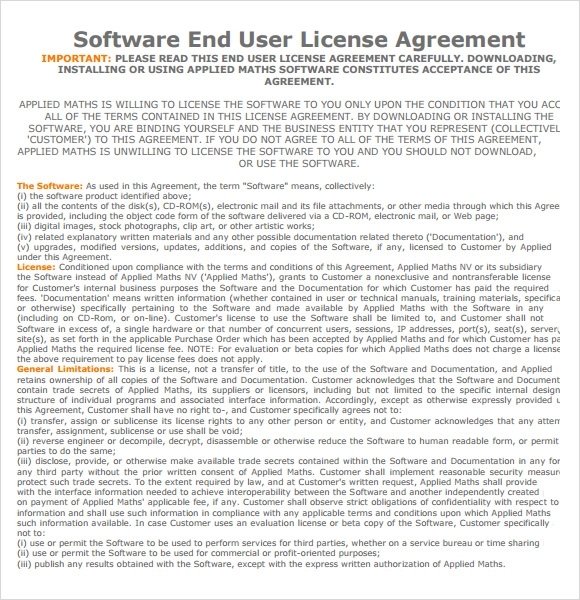 Why Do You Need License Agreement Templates? 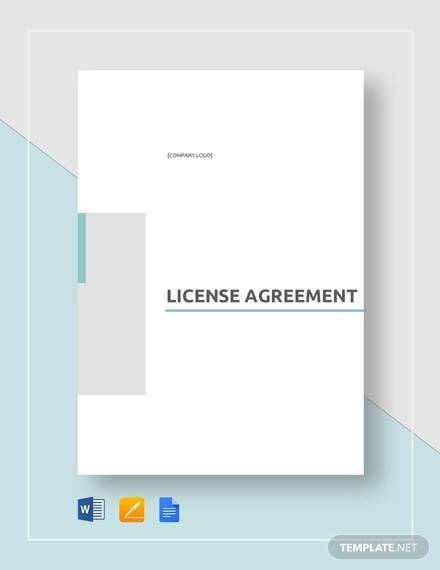 A license agreement makes sure that when you are taking license to use or sell any product on behalf of any other company or person your rights and responsibilities would be restricted to the predefined terms and conditions. The advantage is that if anything happens in the future, any conflict or problems then you have to follow only which is written in the agreement. 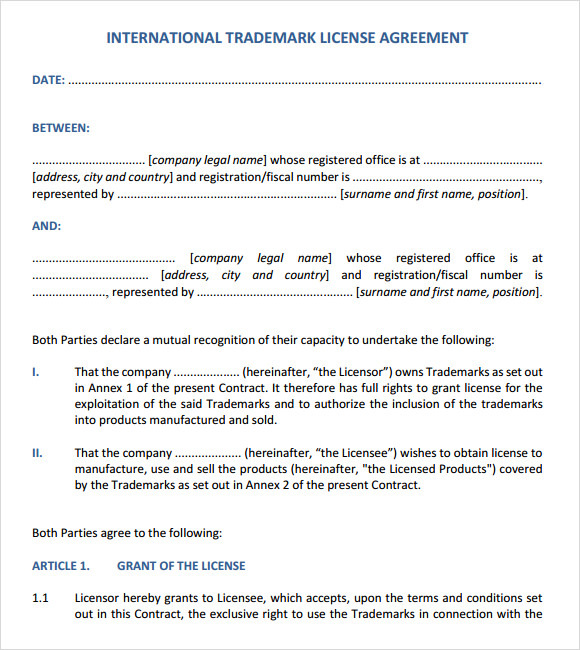 Thus with the help of an agreement, you can make sure that you will not get cheated or tricked by any other party. 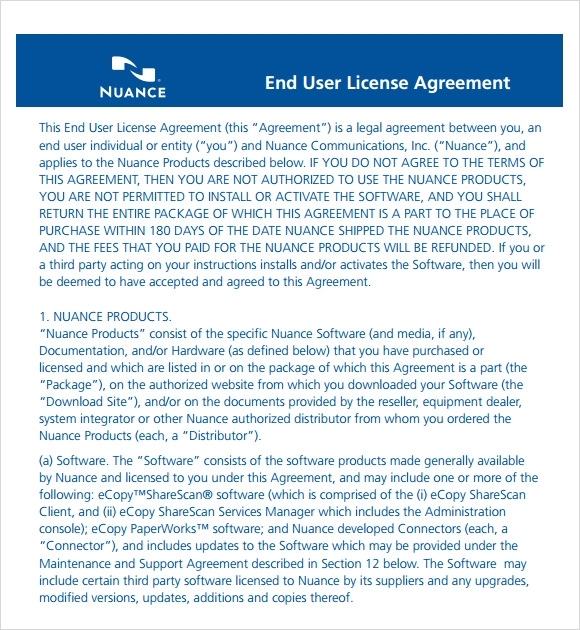 You may like End User License Agreements. 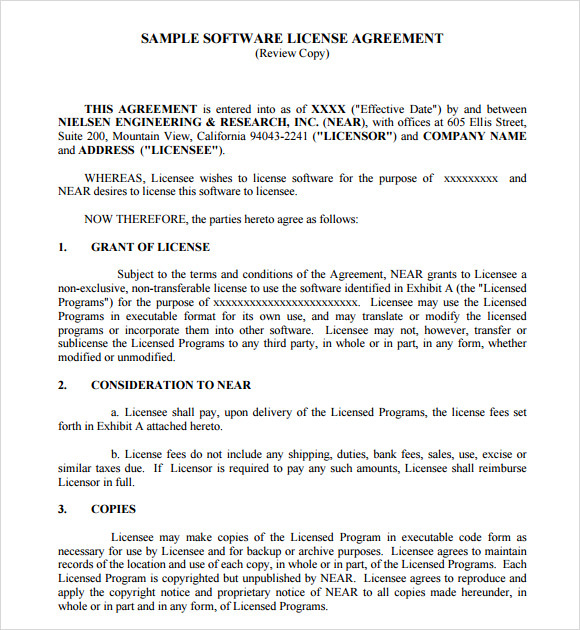 When Do You Need License Agreement Templates? 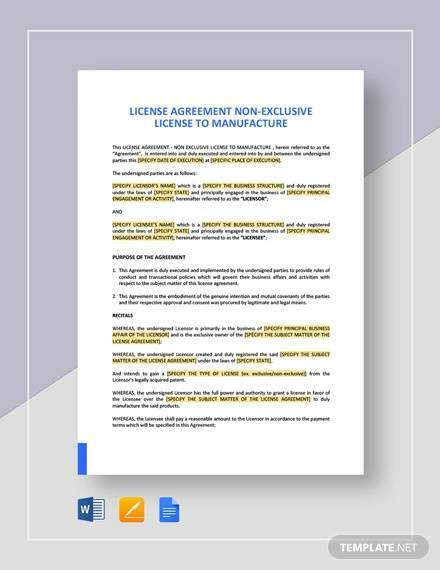 If you are a businessman or working as a commission agent with any company then it’s obvious for you that before commencing of the business you should fix the terms and conditions properly and the percentage of profit that you will earn along with other facilities. But fixing these things is not enough; in addition to that you also need to write them properly. 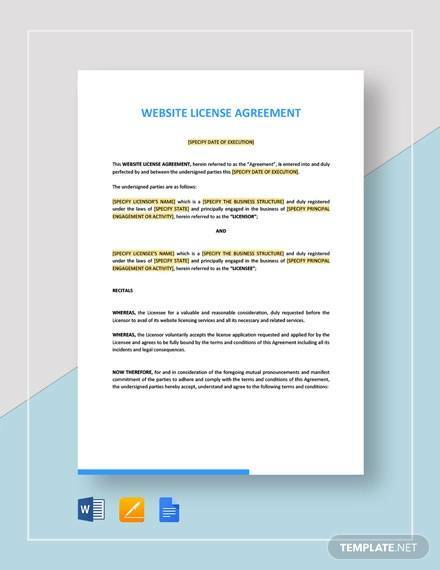 To do this you need a proper format and professionally written agreement, but if you are not aware of the style of writing and all the terms and conditions then using license agreement templates is the best way. 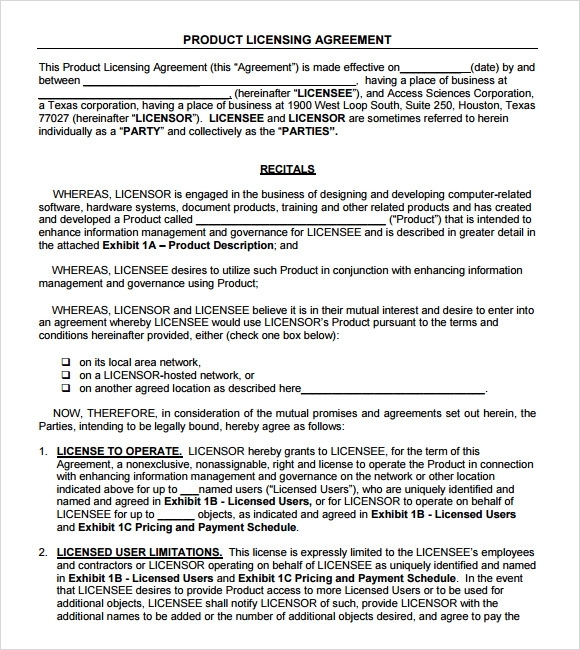 What Are the Benefits of License Agreement Templates? There are various benefits of written contracts like your interest can be safeguarded properly and in the event of any conflict you can only perform your own responsibilities. Nobody can compel you to do things which are written in the contract. 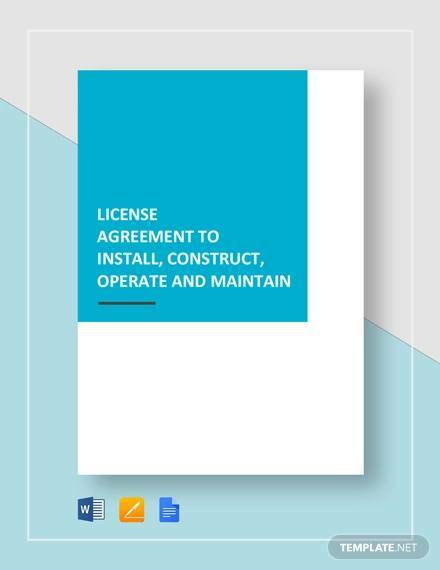 With a template for agreement, you can get the benefits of tailor-made solution, a handy option to save time and labor of yours and also cost too. 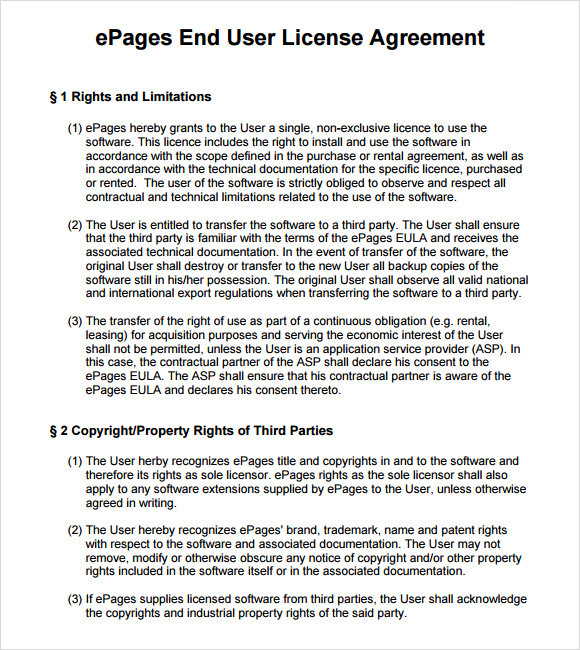 These templates are designed to give the users all the benefits that they should get in a contract. 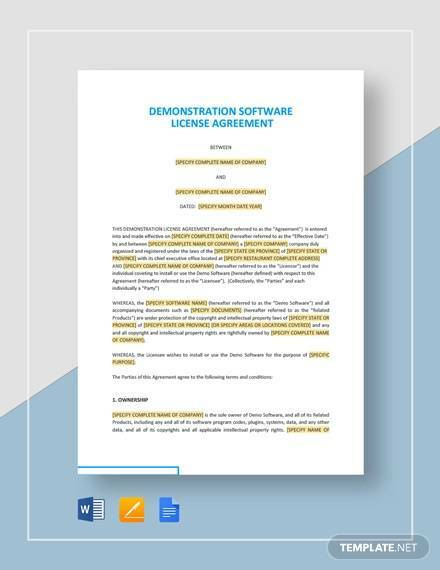 As these license agreement templates are obtainable in both PDF as well as word format, you can download them easily and use whenever you need them.